Flow cytometric analysis of MDA-MB-231 cells (blue) and Jurkat cells (green) using Coronin 1A (D6K5B) XP® Rabbit mAb (Alexa Fluor® 647 Conjugate) (solid lines) or a concentration-matched Rabbit (DA1E) mAb IgG XP® Isotype Control (Alexa Fluor® 647 Conjugate) #2985 (dashed lines). 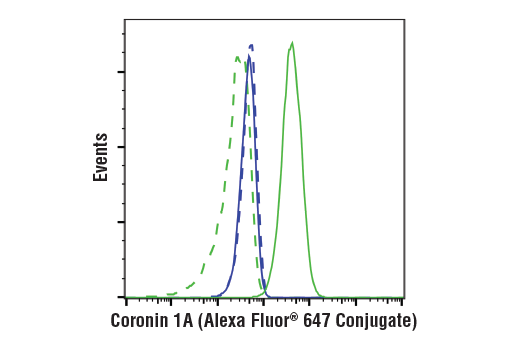 Coronin 1A (D6K5B) XP® Rabbit mAb (Alexa Fluor® 647 Conjugate) recognizes endogenous levels of total coronin 1A protein. Based on the sequence of the immunogenic peptide, this antibody is not expected to cross-react with other coronin protein family members. This Cell Signaling Technology antibody is conjugated to Alexa Fluor® 647 fluorescent dye and tested in-house for direct flow cytometric analysis in human cells. This antibody is expected to exhibit the same species cross-reactivity as the unconjugated Coronin 1A (D6K5B) XP® Rabbit mAb #92904.